My featured artist today is probably unknown to most of you as he was to me. He is the late Gothic painter Ulrich Apt the Elder, who was born in Augsburg around 1460. The work I am featuring today fascinated me when I saw it the other day at the Northern Renaissance Dürer to Holbein exhibition, which is being held at the Queen’s Gallery in London and runs until April 14th 2013. It is a wonderful exhibition and one I can thoroughly recommend. My Daily Art Display’s featured oil on limewood work today is entitled Portrait of a Man and His Wife and was completed in 1512. In all, the artist painted three versions of this work. One may wonder why he should do that and the answer could well lie with why the picture was painted in the first place. It is thought to be a painting to commemorate a wedding and therefore, as we do nowadays, commemorative copies celebrating the marriage were given as gifts to various close relations as well as one being kept by the happy couple. One copy of the painting is now held in a prívate collection, one is now owned by the Queen of England, having been first acquired for the collection of King Charles I, who received the painting as a gift from Sir Henry Vane, the Comptroller and then Treasurer of the King’s Household. A third version is on display at the Metropolitan Museum of Art in New York, which acquired their painting in 1912. The incorporation of a detailed landscape view seen through a window has probably derived from artists such as Hans Memling and its inclusion in this work highlights the power of the Netherlandish influence on the artists of Augsburg in the latter part of the fifteenth century. Hans Holbein the Elder, another Augsburg painter, would often incorporate architectural settings in his portraits. Although this is essentially a wedding portrait and the focus of the painting is the bride and groom, look at how Ulrich has spent much time in the fine painstaking details of the background landscape with its trees and buildings. Although I cannot find a picture of the third copy of this painting it is easy to see the differences in the two paintings on offer today, which may lead one to believe that different artists in Ulrich Apt the Elder’s workshop may have had some part in the execution of the works. A tracing for the figures was obviously shared since they match almost perfectly. The one in the privately owned Schroder collection is said to be of the highest quality and it is believed that all of that work was carried out by Ulrich Apt himself. The version held in the Royal Collection, which was previously considered to be a seventeenth-century copy of that in the Schroder collection, has revealed that after recent cleaning and conservation work, it is a very good version by Apt and his workshop. Originally thought to be by Quinten Massys, and at the end of the seventeenth century it was attributed to Holbein the Younger and furthermore, in the nineteenth century it was thought to be a portrait of his parents. However in 1928, the German art historian Karl Feuchtmayr identified the artist as Ulrich Apt. The Metropolitan Museum of Art’s copy, shown above, is different in a number of ways to the one held in the Royal Collection. The first and most obvious difference is the colour of the woman’s dress. In the Royal collection she is wearing a dress, the color of which is drab brown, whereas in the New York painting it is light turquoise. According to the MMA, their copy of the painting has been severely overcleaned in the flesh tones. They also comment that splits that run horizontally across the panel at the levels of the sitters’s mouths and foreheads have been filled and in-painted. 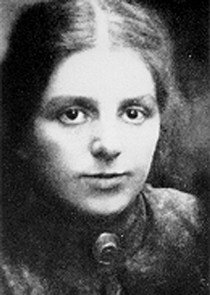 My blog today concludes my look at the life of the German Expressionist painter, Paula Becker, later to become Paula Modersohn-Becker. For her early life you should first read my last blog. As I told you in that last blog, Paula moved to Worpswede and joined the other artists in 1898. The artist colony provided her with a lot of inspiration. She was influenced by resident artists such as Heinrich Vogeler, whose house, the Barkenhoff, was the centre of the artistic community. She became great friends with the young sculptor Clara Westhoff and the poet Rainer Rilke, who in 1901 would marry Clara. She also struck up a friendship with the young German painter Otto Modersohn and his wife Helene. 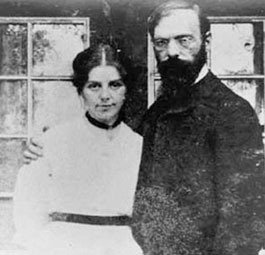 Otto and Helene Schröder had married in 1897 and their daughter Elsbeth was born the following year. Paula was not alone in Paris as her friend, the sculptor from Worpswede, Clara Westhoff, had moved there the previous year hoping to study under August Rodin. At first, life in Paris was difficult for Paula. She lived in a small cramped attic room but she still embraced life in Paris with great enthusiasm and was determined to avail herself of an education in the arts, a thing which was still denied to women in Germany at the time. Whilst in the French capital, Paula Becker studied at both the Académie Colarossi and the École des Beaux-Arts, and made numerous visits to the Louvre, all the time taking pleasure in absorbing the artistic life of the city. Through her friend Clara, she met and got to know sculptor Auguste Rodin. She made many visits to contemporary exhibitions and was deeply impressed by the works of the Post-Impressionists especially Paul Cézanne, Vincent van Gogh and Paul Gauguin. She was also influenced by the strong colours used by the Fauve artists and the Realism style of Jean-François Millet. From April to November of 1900, Paris hosted a World Fair, known as the Exposition Universelle. The reason for this great event was to celebrate the achievements of the past century and to accelerate development into the next. Paula invited Otto Modersohn, who was still at Worpswede, to come with his wife and daughter and see the great exposition. Otto Modersohn arrived in Paris in June along with another Worpswede artist, Fritz Overbeck, but he had had to leave his wife behind as she was unwell, suffering from tuberculosis. Tragically she died whilst her husband was still in Paris. He immediately returned to Worpswede to look after his one year old daughter. Paula also returned to Worpswede and during the following year she and Otto Modersohn married and Paula became stepmother to his daughter, Elsbeth. 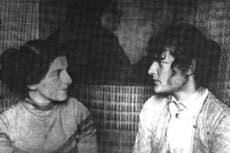 These long periods living away from Otto put pressure on their marriage and after a few years the marriage was all but over and they continued to live separate lives. In 1907 she returned to Otto in Worpswede and it appeared that the two had reconciled. Paula became pregnant and bore a child, a daughter Mathilde. Mathilde (Tillie) Modersohn was born on November 2nd 1907. 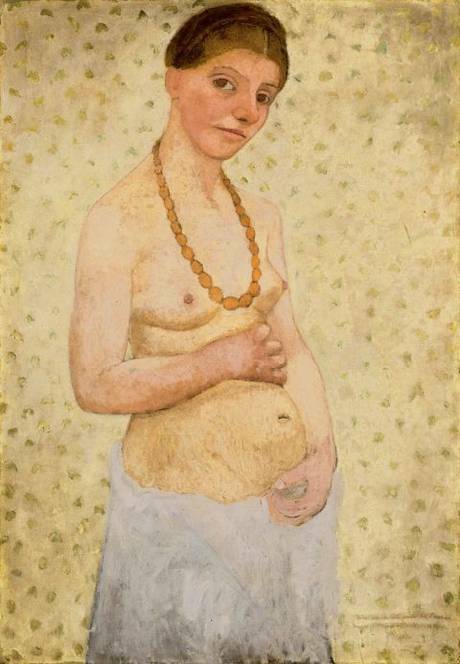 Otto and Paula were delighted with their new arrival but their joy was short lived as less than three weeks later, on November 20th 2007, Paula Modersohn-Becker died from a post-natal embolism. She was just thirty-one years of age. Sadly, that same month Paula’s mother died of a heart attack. I will let you make your own mind up as to why she would want to depict herself as being pregnant. In the painting, she has portrayed herself with the distended stomach of a pregnant woman but her breasts are small and pert and lack the fullness one associates with pregnancy. It is a life-size portrayal, measuring 101cms x 70cms. She stands before us, naked to the waist. Her eyes are level with ours. She stares out at us with her large brown eyes. Her auburn hair is parted in the centre and swept up into a chignon. She half smiles. Her expression is one of self-confidence. She appears unabashed by her nakedness as she tilts her head to one side in a questioning gesture. Her only clothing is a white cloth skirt which is loosely tied around her hips below her distended belly. Her large hands lie above and below her belly. It is as if she is framing and showcasing her pregnancy. Around her neck, and lying between her breasts, is a necklace made up of lozenge-shaped amber coloured beads, which subtly glow against her pale skin. There is a Gauginesque Tahitian look about the painting. It is an unusual and a complex self portrait which she painted on the occasion of her sixth wedding anniversary to Otto Modersohn and we know that, at this time, their marriage was well and truly on the rocks and maybe that is why she signed the painting “PB” for Paula Becker, her maiden name and left out “Modersohn” her married name. Almost a year after her death, Rainer Maria Rilke, the poet and husband of her friend Clara Westhoff wrote the poem Requiem for a Friend in memory of Paula. The poem itself is too long to add to this blog but I have attached the website URL below if you would like to read the full translation of this very moving poem. 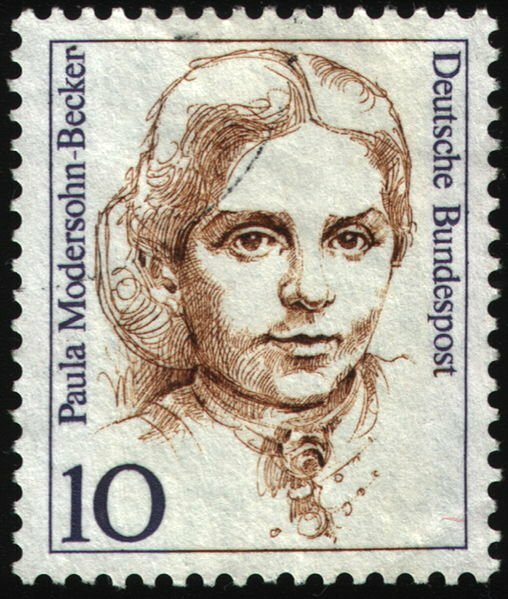 Her daughter Tillie, who died in 1998, aged 91, founded the Paula Modersohn-Becker-Foundation (Paula Modersohn-Becker-Stiftung) in 1978. The Paula-Modersohn-Becker Museum in Bremen has the distinction of being the first museum devoted to the work of a female painter. Early in the 20th century, the patron and merchant Ludwig Roselius amassed a collection of the artist’s major works and this along with works from the Paula Modersohn-Becker Foundation bear out her importance as a pioneer of modern painting. In my last blog I looked at a painting by Johann Friedrich Overbeck entitled The Painter Franz Pforr, which was a friendship portrait he did of his good friend and fellow Nazarene, Franz Pforr. Today I am switching my attention to Franz Pforr himself and looking at one of his most famous works. Franz Pforr was born in Frankfurt am Main in 1788, a year before the birth of Friedrich Overbeck. He came from an artistic background with his father, Johann Georg Pforr, who had started his working life as a miner but due to a serious accident in the mines turned his attention to art and originally worked as a porcelain painter before concentrating his efforts as a landscape artist and skilled painter of horses. Franz Pforr’s uncle, Johann Heinrich Tischbein the Younger, a great friend of the writer Goethe, was part of the great Tischbein artistic dynasty and an art professor at the Kassel Academy of Art. Franz Pforr received his initial art tuition from his father an uncle before, like Overbeck, attending the Akademie der Bildenden Künste in Vienna (Vienna Academy of Fine Arts) in 1805. During the war between Austrian and France in 1805, Pforr volunteered as a guard in the Viennese militia. The conflict affected the young artist’s health and he suffered a nervous breakdown, and would suffer from bouts of depression for the rest of his life. It was probably during these mental upheavals that Pforr turned to religion using it as a crutch to see him through his mental torment. In 1806 he returned to the Academy and resumed his academic studies and for a time saw himself as war artist, recording famous battles on canvas. The Academy director at the time was Heinrich Füger who believed the art course should concentrate on the Neo-Classicisal style of painting. Pforr, like Overbeck, was very disillusioned with the Academy’s artistic tuition and its lack of spirituality and so, in response to this, the two twenty year-old aspiring artists formed the Lucasbund, or Brotherhood of St. Luke (St Luke was the traditional patron saint of artists), deliberately recalling the guilds and the trade organizations of the late Middle Ages. When Napoleon Bonaparte’s troops entered the city in 1809 the Academy was closed down. The following year, 1810, along with Overbeck, Ludwig Vogel and Johann Hottinger, members of their Lucasbund, Franz Pforr moved to Rome and set up home at the deserted Sant’ Isidoro monastery. They began to wear their hair long, and wore anachronistic medieval monk-like habits. The members of the group took vows of poverty and chastity almost as if they saw their group not simply as an artistic association but a religious one. They still referred to themselves as the Brotherhood of Saint Luke but because of the way they look and acted most everyone else called them the “Nazarenes”. The agenda of the Nazarenes was to reject the whole legacy of Baroque and Neoclassical art that was the dominating art of the day. These young German artists sought inspiration in Italian painters of the early Renaissance, such as Raphael Sanzio as well as the German art of Albrecht Dürer who were to be their artistic benchmarks. Most of all they wanted their art to have a sense of spirituality. They wanted it to be more honest, truthful, and sincere art similar to that of the late Middle Ages and Early Renaissance. The subjects of their works of art were dominated by religious themes. The Nazarenes disbanded in 1820 but for Franz Pforr his life with the group ended eight years earlier as he contracted tuberculosis and died in Albano Laziale, a suburb of Rome, in 1812. The artwork of Franz Pforr calls to mind a sort of fairy-tale medievalism, awash with bright colours and picturesque details. 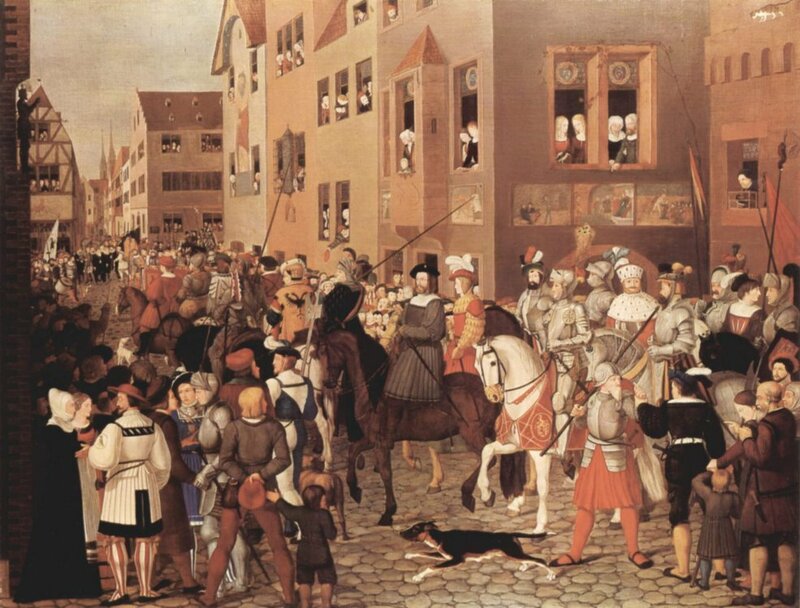 This can be seen in today’s featured painting by Pforr which he completed before he travelled to Rome, entitled The Entry of Emperor Rudolf of Habsburg into Basle, 1273. This large medieval subject is consciously painted in a historical manner. The subject of the painting is the entry into Basle of Rudolf of Habsburg and it is a pictorial tale of German pride and the country’s defiance of Napoleon Bonaparte. Rudolf, who had inherited his father’s estates in the Alsace region, had also forcefully taken possession of the cities of Strasbourg and Basle and vast tracts of land in the western part of Switzerland. It was in 1273, as he was laying siege to the Swiss city of Basle, that he heard that he had been elected to become the new German king by the prince-electors of the Holy Roman Empire,. He would be crowned Rudolph I in Aachen cathedral in October of that year. If we look to the horseback rider just left of centre we can see the black double-headed Habsburg eagle emblazoned on the back of his gold-coloured jacket. The inclusion of this Habsburg eagle was thought to be Franz Pforr’s idea of defiance against Napoleon Bonaparte, who had been at war with the Germans and had occupied Pforr’s home town, Frankfurt in 1805. Pforr was also affected again by Napoleon Bonaparte in May 1809 for he was a student at the Vienna Academy when Napoleon entered and occupied the city and the art establishment was closed down. Before us we see flattened perspectives. The figures in the painting, in some ways, look uncoordinated often with head and shoulders portrayed at impossible and unrealistic angles. There is almost a child-like innocence about the painting. It is indeed a colourful painting but the colours are of a slightly muted and weak nature as was the case in many of the Nazarene works of art. There is not the vibrancy and brightness of the colours used by the artists of the English nineteenth century Pre-Raphaelite movement, which was greatly influenced by the art of the Nazarenes. Der Maler Pforr (The Painter Franz Pforr) by Johann Friedrich Overbeck. On a number of occasions whilst talking about the life of a nineteenth century artist I have recounted how they had been in Rome to further their artistic careers and had come across a group of German artists known as the Nazarenes. Today I am featuring one of the leading members of this group, the German painter, Johann Friedrich Overbeck. Overbeck was born in Lubeck in 1789. He was brought up in a very religious and also a very wealthy household. His ancestors for three generations had been Protestant pastors. His parents were Elisabeth Lang and Christian Adolph Overbeck, who was a doctor of law, and who was also a Lubeck senator. In 1814 he actually became the burgomaster (mayor)of his home town. Johann Oberbeck’s early schooling was at the nearby grammar school where his uncle was the master. Overbeck studied the classics and received artistic tuition whilst attending this school. At the age of seventeen, having completed his schooling, Overbeck left his home town and went to Vienna where he enrolled at the Academy of Fine Arts, which at the time was run by German portraitist and historical painter, Heinrich Füger. Overbeck, with his strong religious beliefs, believed that at this time in Europe, Christian art was in decline, and it was this very belief which was to shape his future artistic career. Overbeck continued at the Academie until 1809 but he constantly found it ever more difficult to accept the situation and became more vociferous in his condemnation of the artistic tuition offered by the establishment and soon the situation became irreconcilable. Whilst at the Academie he became close friends with Franz Pforr and together with Ludwig Vogel, Joseph Wintergerst, Joseph Sutter and Konrad Hottinger, all of who were similarly disillusioned with the artistic teaching at the Academie, they decided to take matters into their own hands. In June 1809 they formed an art association which they called the Brotherhood of St. Luke or Lukasbrüder. The decision as to whether to remain at the Academy was taken out of Overbeck’s hands as in 1809 Vienna was occupied by French troops and the artistic establishment was closed down. Later when it re-opened it could not take in “foreigners” and Overbeck and Pforr could not gain re-admission. Four of the members of the Lukasbrüder, Overbeck, Pforr, Hottinger and Vogelthen decided to head to Rome and in June 1810 they set up home in the empty monastery of Sant’ Isidoro, which had just been dissolved by Napoleon Bonaparte . It was to become the home of the newly formed artists’ colony. This newly assembled art group lived and worked with new recruits in their deserted monastery home and because of the way they dressed similar to monks and because of their long flowing hair, they were known as the Nazarenes. The group led a quasi-monastic lifestyle. The ethos of the group was based on fraternity and a frugal lifestyle. The principle of their art was that it should be both simple and sincere, which was at odds with the academic principles of their time. There was a sobriety in the way they chose colours for their paintings. Overbeck and his group fervently believed that art was a divine mission. Sadly two years after arriving at Sant’ Isidoro, Franz Pforr died of tuberculosis. He was just twenty-four years of age. 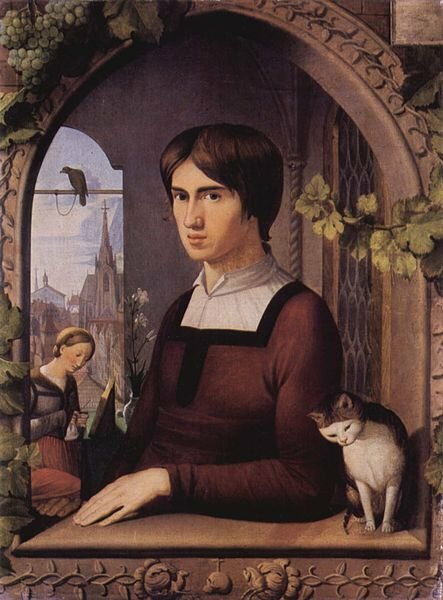 My Daily Art Display today features a friendship portrait by Johann Overbeck of his fellow artist Franz Pforr, which he completed in 1810, around the time the pair arrived in Rome. The painting is entitled Der Maler Pforr (The Painter Franz Pforr). The painting is housed in the Staatliche Museen of Berlin but is currently on display at the Tate Britain, London, as part of the Pre-Raphaelites Victorian Avant-Garde exhibition. 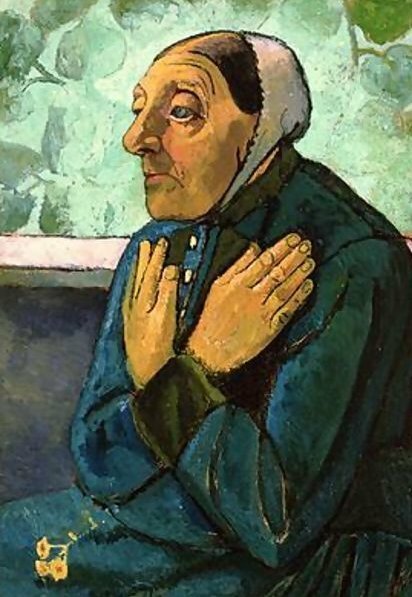 The Nazarene artists often painted quasi-devotional portraits of each other and in some of the paintings they would include what they considered would be their choice of an ideal wife for their friend and this is exactly what Overbeck has done for his friend Franz Pforr. There was also a great deal of religious symbolism in these works. Franz Pforr had been a very close friend of Overbeck since their days at the Vienna Academy and it was he who had encouraged Overbeck into studying the work of the German Masters, such as Hans Holbein, Albrecht Dürer and Lucas Cranach. There is a typical German feel to this work by Overbeck and maybe in a way it was a testament to the help and guidance Pforr had offered him. 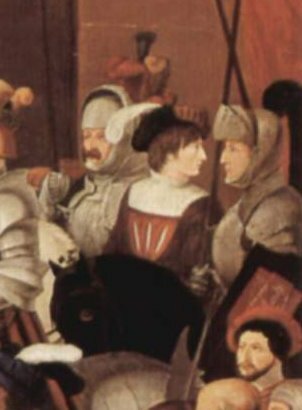 Before us we see a young-looking Franz Pforr, who is not wearing nineteenth century clothing but instead is dressed in a typical German costume of the late 16th century. He is sitting at a gothic loggia and, through the opening behind him, we can see a typical German townscape with a tall-spired church. Further back, behind the town there is what appears to be a coastal scene. To the left of the painting we see a woman busily sewing as she reads text from a book. She is the ideal wife whom Overbeck as “bequeathed” to his friend. She is both dutiful as shown by her sewing and religious by the way she reads from what is probably some religious text or the Bible. These are two characteristics, which no doubt both Overbeck and Pforr would look for in their “perfect” wives. Add to this the vase of white lilies, which has become the flower of the Virgin and symbolises purity and you have the perfect woman ! The falcon, which is tethered to its perch and is therefore a domestic bird, is in religious symbolism a representation of a holy man or a non-believer who has been converted to the Christian faith. Pforr has been portrayed with his left hand resting on the stone sill with the watchful cat at his elbow. There is a look of satisfaction in his face and maybe that is to reflect the inner peace he has achieved through religion. This is a beautiful painting and the first one I came across when I visited the Pre-Raphaelite exhibition at the Tate Britain in London. The exhibition lasts until January 13th 2013 and then moves to the National Gallery in Washington (February 17th – May 19th 2013). If you like Pre-Raphaelite paintings then this exhibition is one you should not miss. Author jonathan5485Posted on October 7, 2012 Categories Art, Art Blog, Art display, German artists, NazarenesTags Art, Art Blog, Art History, Brotherhood of St. Luke, Der Maler Pforr by Johann Friedrich Overbeck., Franz Pforr, German painter, Johann Friedrich Overbeck, Lukasbrüder, NazarenesLeave a comment on Der Maler Pforr (The Painter Franz Pforr) by Johann Friedrich Overbeck.